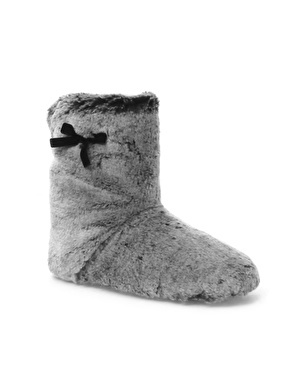 I think they’re called ‘Bootie Slippers’ – they’re warm enough to protect your feet from the morning bathroom coldness. They’re cheap enough to replace, so risk an emergency bread & milk run, get them ruined and buy a new colour. They’re comfortable enough to relegate all other footwear to the ‘special occasions only’ wardrobe. Problem is, they’re for girls. I couldn’t care less about the little bow on the side. Right now, it feels like I’ve had a feet transplant with a polar bear. Just imagine the poor thing, tip-toeing around Alaska with my bony size nines. It’s natural for our extremities to be the coldest parts of our body. So why have we tried to warm our tootsies up with traditional, cardboard-like, granddad slippers over the years? In a time when Louis Spence is accepted on all TV channels, men shouldn’t be afraid to treat their feet to these Faux Fur delights. Is it me or did this post just get really camp towards the end? This footwear does not have any feminine side effects. To be safe, while wearing them, remember to scratch one self 4 times an hour and don’t be afraid to pass wind. The Belkin N wireless router. Its the teat on which all your computers can suckle. Four ethernet ports means you can hook it up to your Xbox 360, PS3, Nintendo Wii and desktop PC. Don’t let you’re laptop miss out though, connect it wirelessly to the Belkin and have a techno overload, just don’t tell Bono. There’s no need to stuff this router behind your TV stand. Unlike rival products, it’s not an eyesore. The piano black finish matches most television sets and of course, the shiny PlayStation 3. The blue lights never flicker, so there’s no corner-of-the-eye disturbance when you’re gaming. The 1200 ft wireless range, goes through walls just like that blue thing from the X-men films. The only worry would be your next-door neighbour leeching your connection. Never fear, if you have a password on your Belkin and a foreign device is trying to connect, a red light will alert you to counter the threat. I’ve been using the router for over a year now with no problems. If you don’t have this Belkin in your home, then all your web-connecting components are malnourished. Feed them, it’s only £25, you cruel, cruel people.